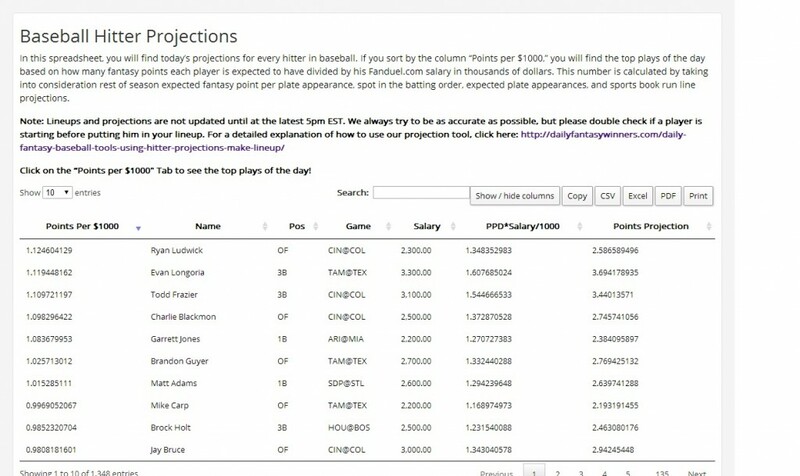 If you haven’t already, sign up for free and gain access to our player projection tool found here: https://dailyfantasywinners.com/baseball-hitter-projections/. Our player projections use several different factors including spot in the batting order, expected plate appearances, sports book run line projections, and handedness. However, they are not an end all be all for picking your lineup on FanDuel, so I’ll be analyzing the top 10 plays according to our sheet so you can see which are truly the best plays. 1) Ryan Ludwick (PP/$1000 1.12, FanDuel salary $2,300) – Easy pick here, Ludwick is batting 5th against a lefty that throws mostly two-seams and sliders. Righties should crush and Ludwick is batting 5th and very cheap. 2) Evan Longoria (PP/$1000 1.12, FanDuel salary $3,300) – Ross is also a two-seam slider pitcher, which means righties on the Rays should crush. Longoria hasn’t had a great series, but that doesn’t sway me. 3) Todd Frazier (PP/$1000 1.11, FanDuel salary $3,100) – Same logic as Ludwick here, except Frazier is a much better hitter and should be godly tonight. 4) Charlie Blackmon (PP/$1000 1.1, FanDuel salary $2,500) – Blackmon is absolutely sick tonight. He’s way too cheap and facing Alfredo Simon who throws a ton of two-seams and should do poorly against lefties. 5) Garrett Jones (PP/$1000 1.08, FanDuel Salary $2,200) – Chase Anderson throws mostly offspeed stuff, which negates Jones’ advantage as a lefty vs a righty. He’s also very cheap at a position that has many high salary, quality plays. He’s great value, but I’m passing on him for an Ortiz, Adams, or Morneau. 6) Brandon Guyer (PP/$1000 1.025, FanDuel Salary $2,700) – Guyer is batting lead off again, which is why he’s such great value. He’s also facing a two-seam, slider throwing lefty. I like him a lot. 7) Matt Adams (PP/$1000 1.01, FanDuel Salary $2,600) – Adams is facing a lefty, but one that throws a lot of off-speed stuff which means lefties should do fine. I actually like him better than Garrett Jones because he fills a little more salary. 8) Mike Carp (PP/$1000 1.00, FanDuel Salary $2,200) – Carp’s PP/$1000 is very misleading. He will likely get pinch hit for in the game which lowers his value significantly, and he also is min salary. I would pass. 9) Brock Holt (PP/$1000 .98, FanDuel Salary $2,500) – 3rd base is sort of a logjam, but don’t overlook Holt. As Danny points out, he’s the only SB threat on Boston against a pitcher who is terrible against stolen bases. 10) Jay Bruce (PP/$1000 .98, FanDuel Salary $3,000) – Bruce has a lefty on lefty matchup, which is taken into account by our projections, but what isn’t taken into account is how well De La Rosa does against lefties. Still, he’s a home run threat and Coors Field is great for home run hitting lefties. 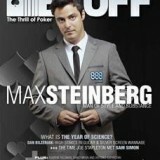 I’d consider him in GPPs.